Tom Stafford was an expert among experts at the Fall Meeting. I became aware of Tom Stafford when Redefining the Age of Clovis: Implications for the Peopling of America was published in Science in 2007. He is the Former Director of the Laboratory of AMS Radicarbon Research at University of Colorado. And for more than decade he has been President of Stafford Research Laboratories — the nation’s top private dating laboratory. He is to be taken seriously when, among other things, he tells you how old something is. I was looking forward to his presentation more than any other at the Fall Meeting. I was not disappointed. Tom — who has never previously published with the YD team — laid out a very, very, tight and narrow layer of evidence supporting the purported event. 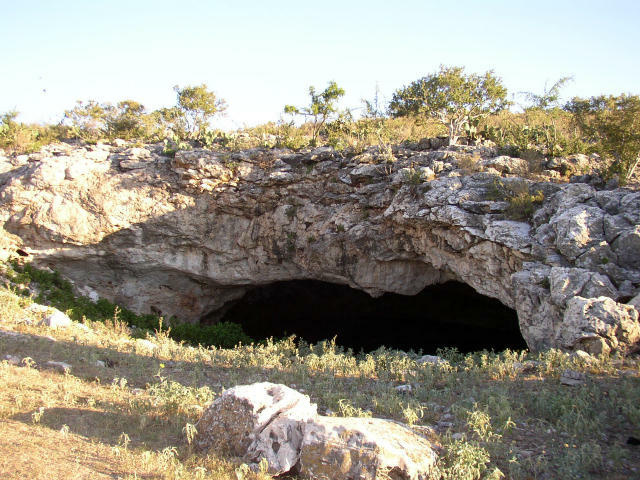 In short, 151 centimeters below the surface at the pefectly stratified Hall’s Cave Paleo site in Texas was a 1 to 2 cm layer of dirt that was host to trillions of nanodiamonds and high levels of soot known as aciniform. Not above — not below. Geology of Hall’s Cave, Texas. Thickly stratified — 3.7 meters. Tom then gave several slides and narrative regarding the quality of the sampling at Halls Cave, and the nature of samples taken along the Younger Dryas period, showing clear peaks of markers overlaid on an actual photos of the stratified cave sediment wall. According to Tom, each centimeter you go down you can click off fifty years (at that level). Tom said that the nanodiamond and aciniform evidence is unequivocally associated with the beginning of the Younger Dryas. He also pointed out that at Hall’s Cave, no more Megafauna is found above the very layer identified by the nanodiamonds. He went to on to share — in a slightly astonished manner — the nature of the stranger nanodiamonds at Hall’s Cave. He said that Hex-Diamonds (those pesky ones that only come from space), the N-Diamonds and P-Diamonds were all found and photographed at Hall”s Cave. He showed one photo of a perfect diamond sphere “lattice” made up of 3000 “twin” diamonds of i-carbon. Pretty weird stuff to find in a Texas Hill Country cave. Pretty weird stuff. Peaks in nanodiamonds and aciniform carbon occur at 151-153 centimeters. Upper boundary is sharp base is gradual. Humic Acids Date~100 RC older than bone Therrfore “ET” Horizon Dates ~11,o055 Radio Carbon years 13,060-12, 905 CAL BP. A DISTINCT CHRONOGRAPHIC STRATUM IS PRESENT AND DATES TO THE BEGGING OF THE YOUNGER DRYAS. Analyze for ET proxies at 25 intervals betwen 0 and 18 KA over cave’s 3.7 meter thickness. Perform similar precision sampling, C14 dating, and other proxy anlysis at otehr sites. My take: Why on earth would this man suddenly join the YD Team at AGU — out of nowhere and not previously published with them — unless he had truly found something extraordinary in the course of his own work — and somewhat contrary to his own experience!? The modern YDB hypothesis (non-Platonic) is hardly ten years old. Despite intermittent attention it has suffered near ceaseless rock-throwing, drive-by commentary and half-baked popular and professional press articles [links to come]. At this point — even if it is a ‘cool theory’ — you don’t jump up for the fun and attention. Nope. Tom Stafford did the right thing by helping out someone else’s investigation by using the best tools on his best site. Even better, what he he found was very specifically predicted by the YDB team. That the way it is supposed to work — and it tells us something.